Glenafton claimed a hat-trick of Premier Division scalps in this season’s West of Scotland cup with a penalty shoot-out win over Beith after a goal-less draw at Loch Park. 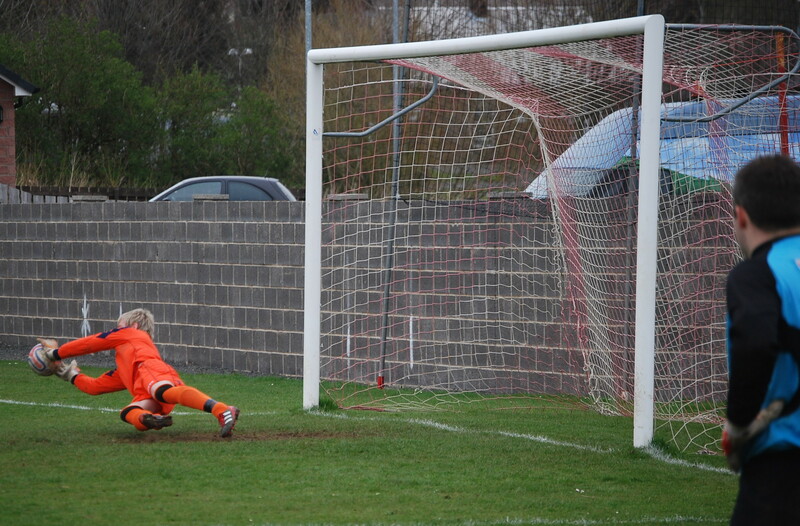 As in the previous round keeper Ally Semple shone in the shoot-out saving two of the visitors spot-kicks. The first half offered up little in the way of clear cut chances as both sides struggled to stamp their authority on the game. The visitors squandered an early free kick from just outside the box and fifteen minutes would pass before they threatened again when Kenny McLean pounced to steal the ball from keeper Ally Semple’s attempt to clear a pass back but the striker could not pick out Calum Hardie in the box and the chance was gone. Five minutes later Beith won a couple of corners kicks but these were quickly mopped up by a well marshalled Glenafton defence. On 25 minutes the home side were rather more inventive with a corner kick that caught the visitors’ cold and fell for Paul Murphy on the edge of the box but his volley whizzed wide of keeper Neil Greenwood’s goal. A minute later Craig Potter played the ball into the box for Paul McKenzie to give chase but the impressive Ross Dunlop matched his run allowing Greenwood to race from his line and gather the ball. Beith introduced striker Christiano Kisuka at the interval and Henderson and Potter were forced to combine to bring the youngster’s determined first foray upfield to an end. At the other end the home side won two corners in quick succession with Gus Cochrane’s deliveries causing a stir as the temp of the game improved markedly. On 57 minutes the Mighty looked certain to take the lead when Stuart Callaghan was through on goal but Semple dived bravely and with both fists punched the ball to safety. As the half progressed the industrious Glens began to edge the midfield battle with Murphy pulling the strings and McKenzie in a menacing mood the Beith goal was seeing most of the action. On the outskirts of the box and with his back to goal McKenzie hooked a wicked shot that had Greenwood scurrying across his line and relieved to see the ball sneak past the post. A minute later Cashmore left John Sheridan for dead and as Mark Staunton closed in he lashed the ball from 20 yards out but too high to threaten the goal, which in any case Peat had covered. On 67 minutes Cashmore from the right touchline chipped a cute ball into the box and despite the close attention of Dunlop his strike partner Dempster met the ball on the drop but his stunning volley went wide of target with Greenwood a stunned spectator. Five minutes later the fresh legged Gareth Armstrong replaced Cashmore who left a well-earned roar from the home support appreciative of his efforts. Beith too had freshened things up and Ryan Holmes looked lively on the ball but again there was too be no end product from the visitors’ inventive play as his good worked ended with a rushed shot sailing a high and wide of target. At the other end Staunton came to the rescue as Dempster got on the end of a long ball into the box and forced the Glens’ striker away from goal allowing black and white strips to flood into the box; nevertheless Dempster’s perseverance won his side a corner, which in turn would lead to another. Cochrane’s delivery picked out Armstrong who rose unchallenged to head the ball into the six yard box where Dempster with his back to goal tried to valiantly to guide it home but Hardie and Greenwood shoulder to shoulder combined to eventually scramble the ball clear. In a flash Reid played a quick one two taking him the length of the park where his run was ended by Richie McKillen, however the resultant free-kick came to nothing as Menzies outleapt McLean at the back post. The penalty shoot-out began and ended with a touch of class. 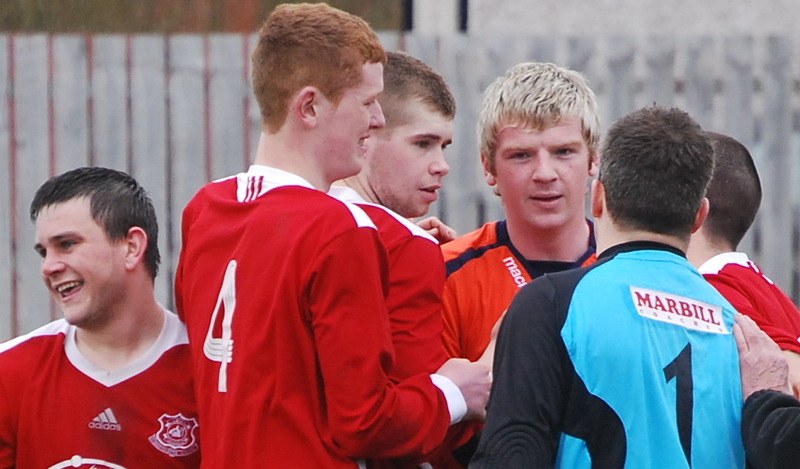 Glenafton’s youngest player Gus Cochrane had the courage to step up to take the first penalty for the home side while Beith’s goalkeeper Neil Greenwood was first act at the conclusion of the contest was to seek out and congratulate his counter-part Ally Semple, whose double save effectively won the tie. 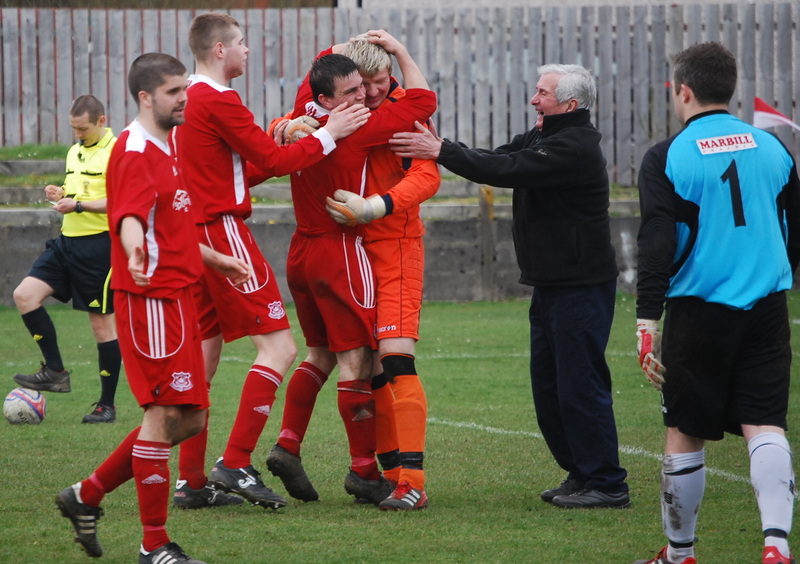 Gus Cochrane opened the scoring for Glenafton before Ally Semple saved from Andy Reid. Paul Murphy and John Dempster added to the Glens tally before Mark Peat saved from Richie McKillen. Gareth Armstrong scored for the Glens before the shoot-out went into sudden-death with the sides tied at 4-4; Paul McKenzie scored the Glens and Ally Semple saved from Christiano Kisuka. Glenafton will now host the Irvine Meadow or Shotts Bon Accord in the semi-final. This entry was posted in GAFC Match Report and tagged Beith, Glenafton Athletic, New Cumnock, Scottish Junior Football, Siney's Video, West of Scotland Cup. Bookmark the permalink.